Denmark is still largely a diesel country. These huge 6 axle diesels of the class ME were delivered by Henschel beginning 1981 already. There were many problems with them initially, but now they operate quite well, despite their age. 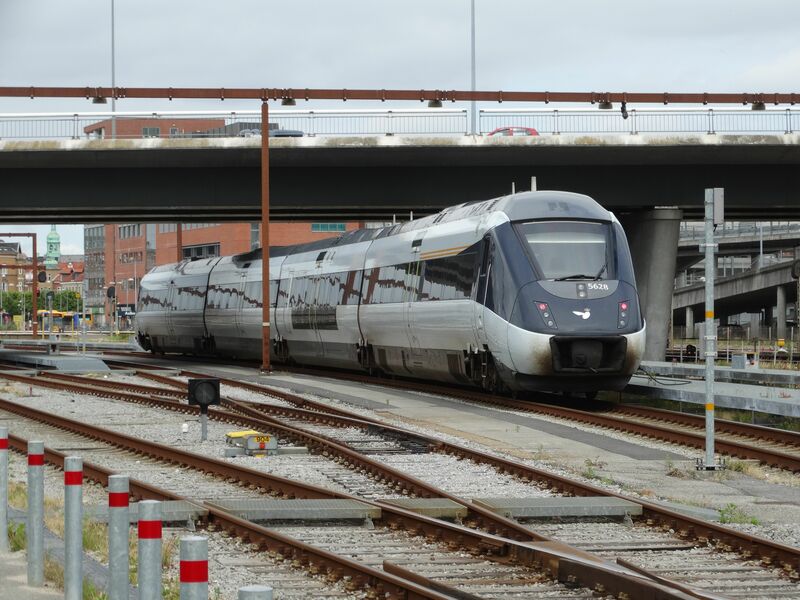 This type of class ME driven double decker trains are especially common around K�benhavn/Copenhagen. Picture in Nyk�bing 11.7.2013 by Ilkka Siissalo. 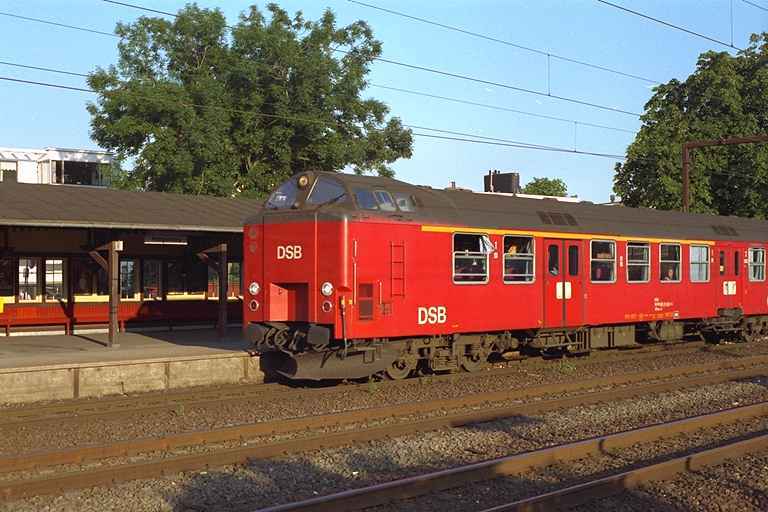 Today the class ME diesels typically haul push-pull double decker coach trains where the coaches are made by Bombardier and are essentially identical to those used in Germany. 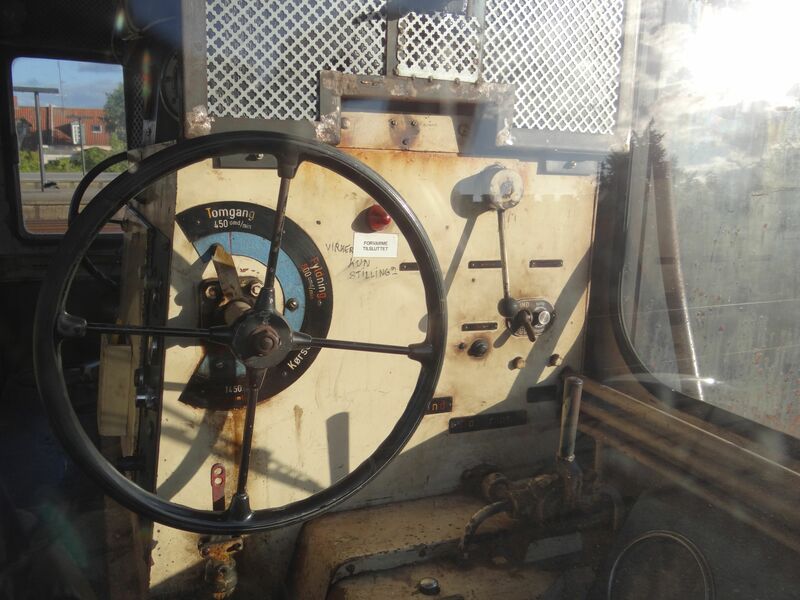 This is the steering wagon found at the other end of each such train. Picture at K�benhavn C 12.1.2010 by Ilkka Siissalo. 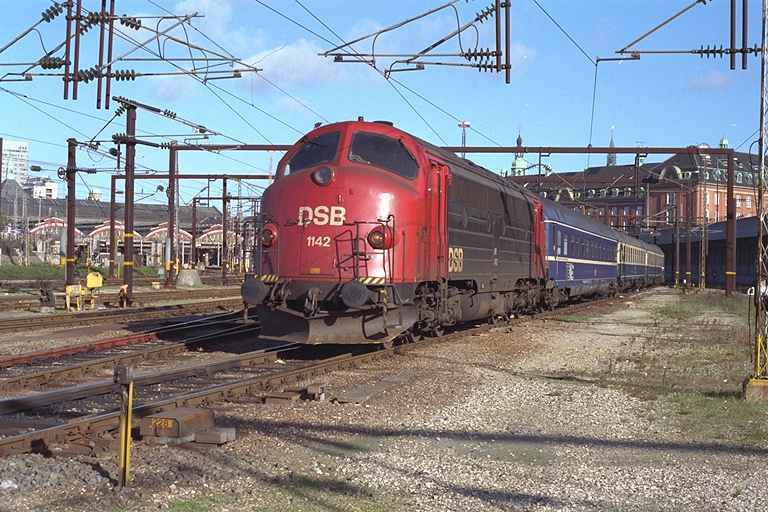 One of the huge class ME diesels with a rake of Bombardier built doubledecker coaches is arriving from K�benhavn to Nyk�bing. Photo at Nyk�bing (Falster) station 21.9.2014 by Ilkka Siissalo. 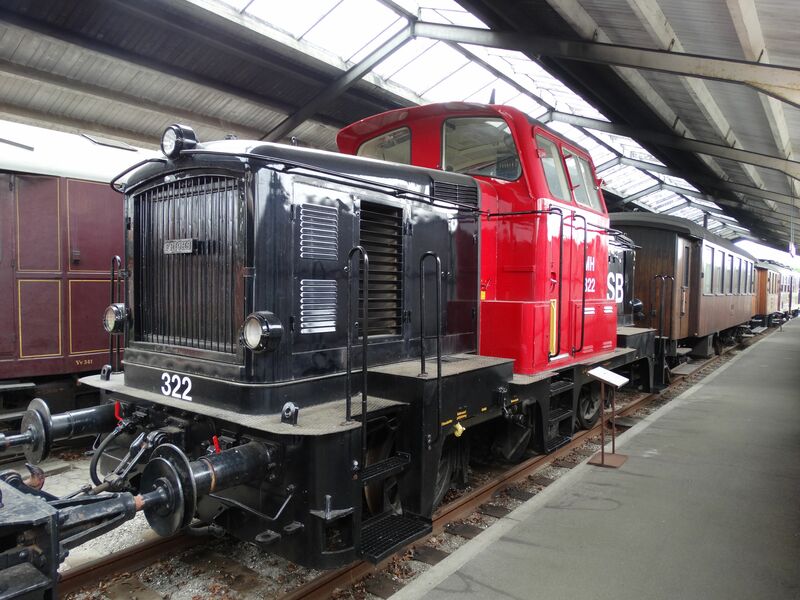 In 2003 some of the class ME diesels were still to be seen in their original black and red colours. Picture at Nyk�bing (Falster) station 2.3.2003 by Ilkka Siissalo. 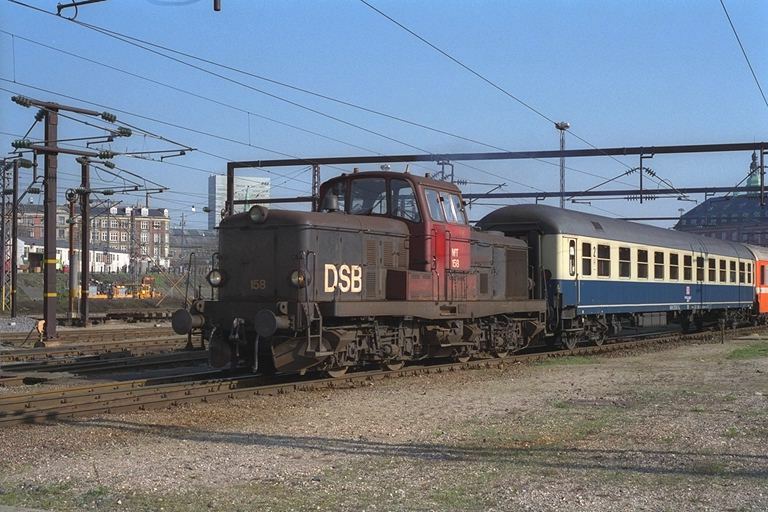 Before DSB bought modern and comfortable doubledecker coaches from Bombardier for the Copenhagen area commuter traffic, a typical commuter train looked like this: Old 1970s coaches together with an ugly steering wagon hung behind a huge class ME diesel. 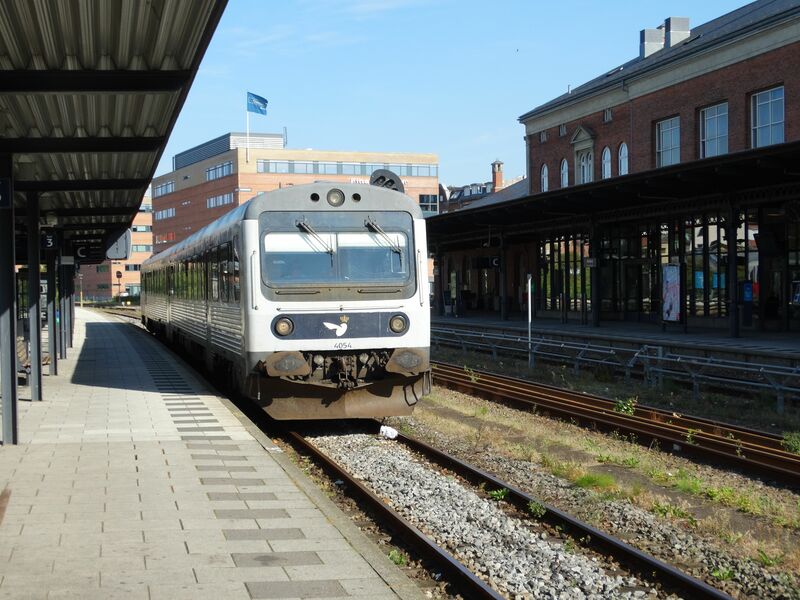 This picture is from 2010 when these compositions were no longer in regular use, but the picture is from Roskilde station during the time when the famous Roskilde rock festival was taking place. 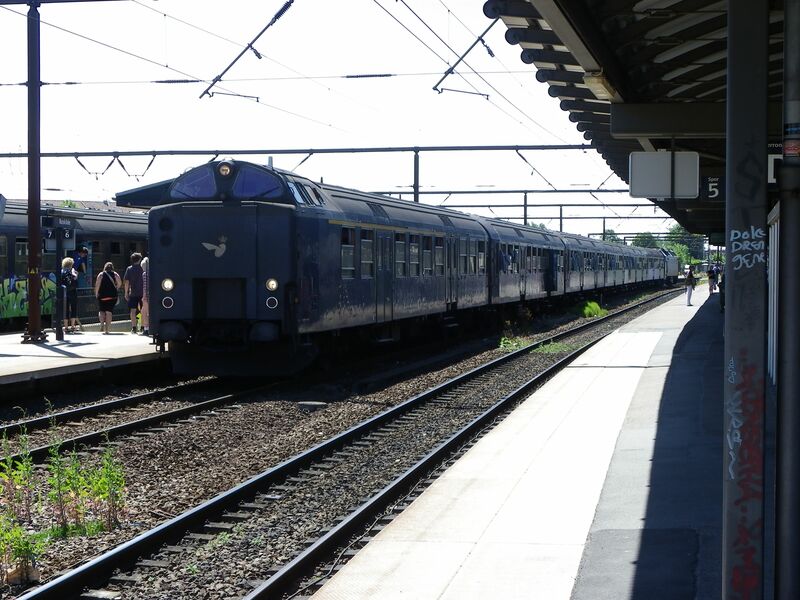 Many of the rock festival visitors were dead drunk and not so tidy, so DSB used old rolling stock to haul them from the airport and harbour to Roskilde. Picture at Roskilde station 1.7.2010 by Ilkka Siissalo. 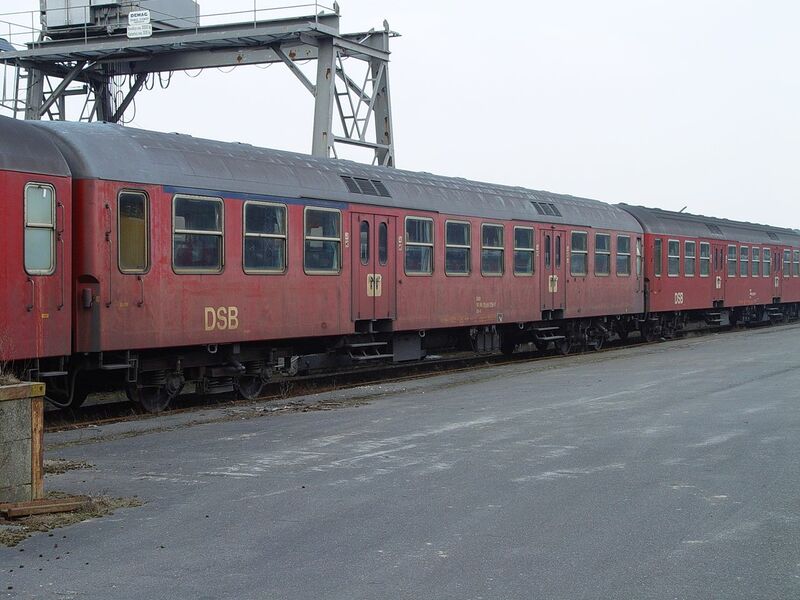 And this is how the typical old wagons that were typically used with the ADns-e steering wagons, still in their original red livery in 2003. 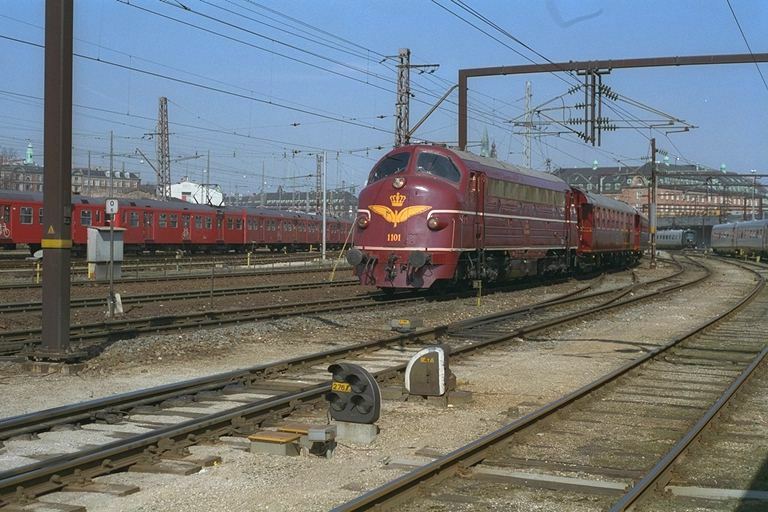 They closely resemble German so called "Silberling" wagons of 1960s. 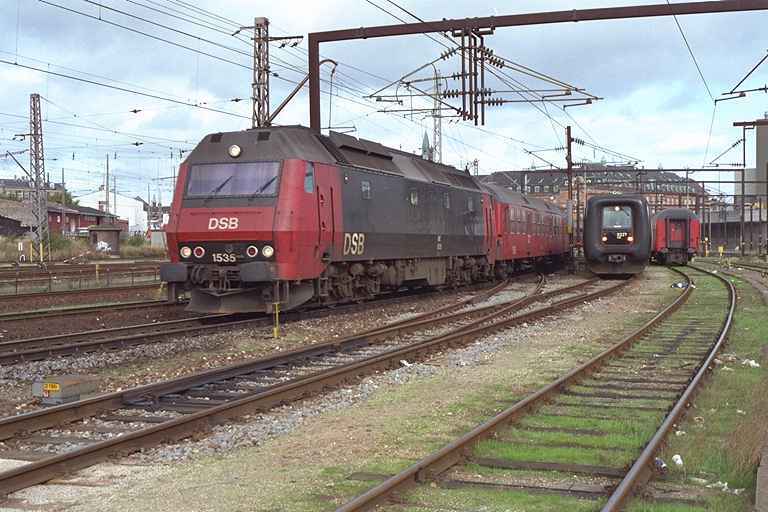 This kind of trains together with the huge class ME diesels shown above were still the typical Danish regional trains in the beginning of the 2000s. Picture from Nyk�bing (Falster) station 2.3.2003 by Ilkka Siissalo. 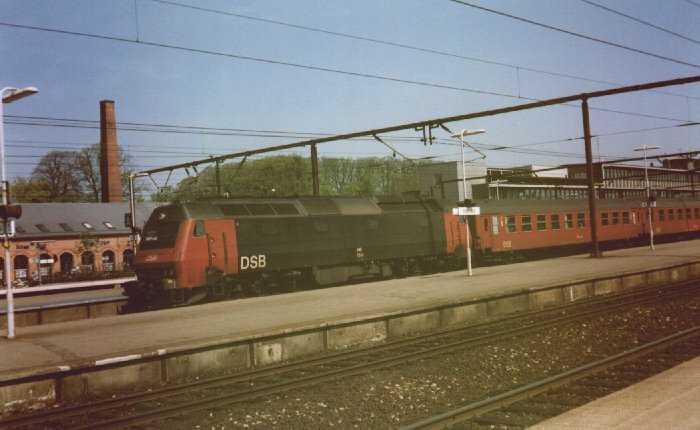 As the Italian built AnsaldoBreda IC4 trains turned out to be a full Italian fiasco, DSB had to quickly get trains from somewhere and rented from the German DB their fleet of the diesel ICE trains of class 605, also known as ICE-TD. 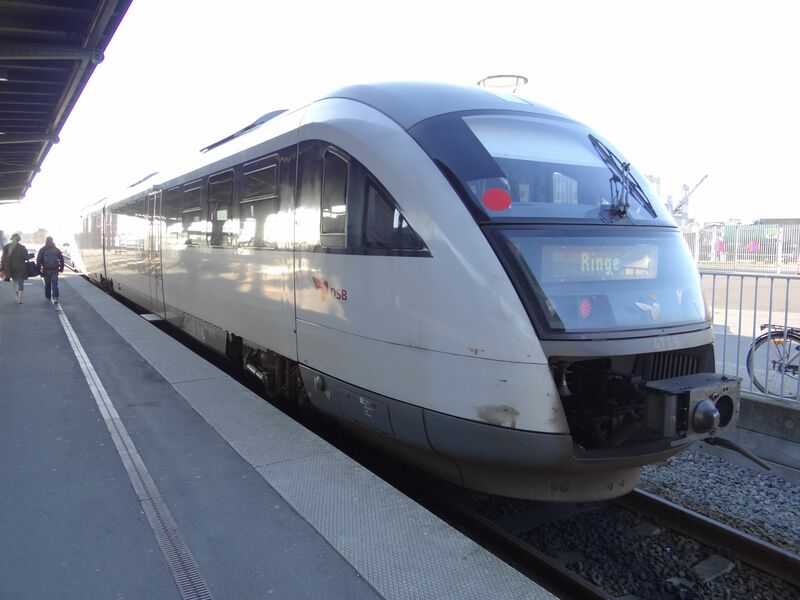 The trains' active tilting technology was turned off and they were fitted with Danish security systems, but the maintenance of the trains remained with DB. 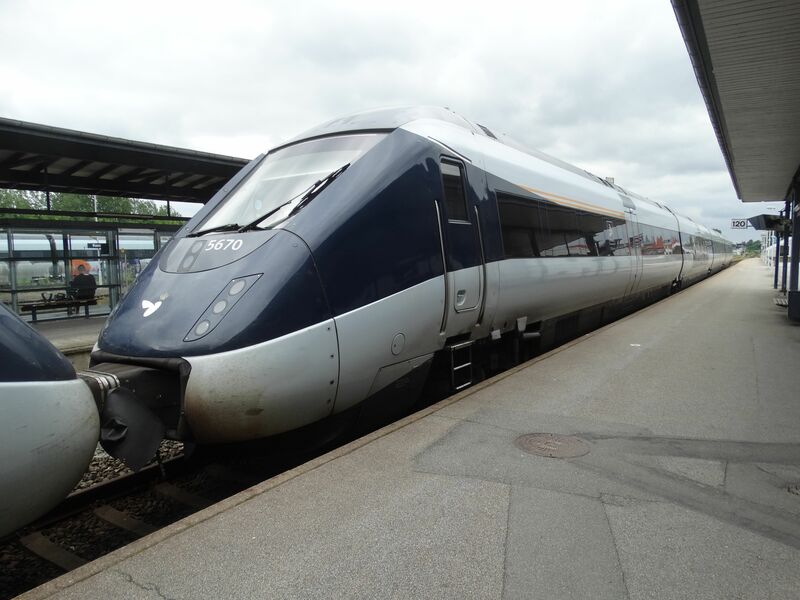 In 2016 however, DB plans to scrap all these quite modern trains as it is a very small batch and maintenance of the ageing trains is becoming excessively more difficult. 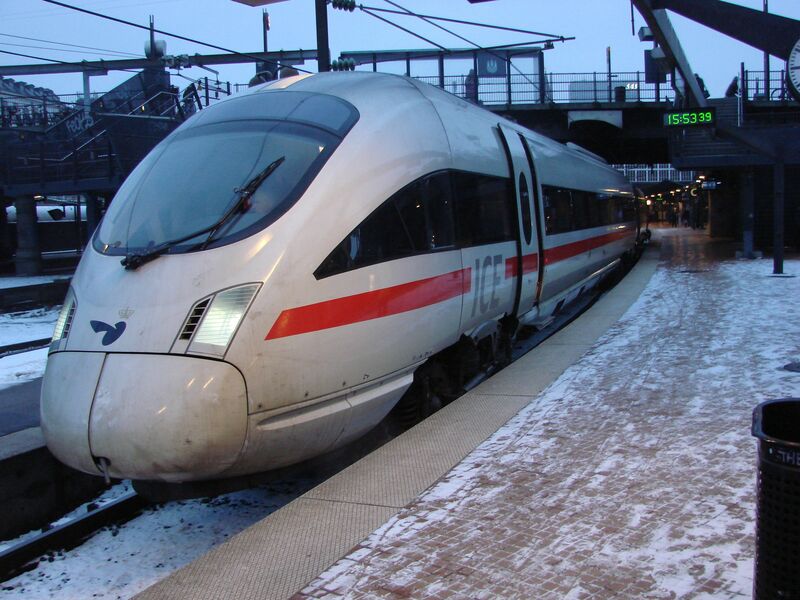 Picture of an ICE-TD with DSB stickers 12.1.2010 at Copenhagen central station by Ilkka Siissalo. 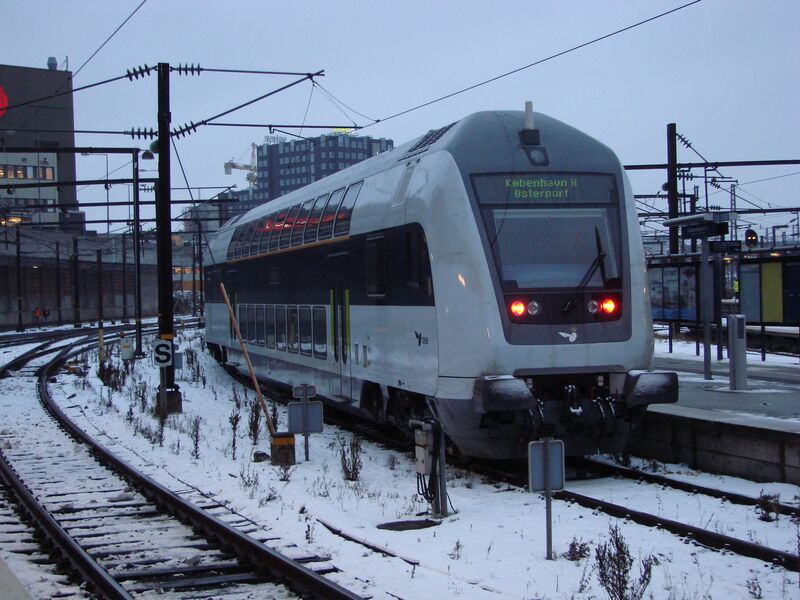 Two ICE-TD trains have just arrived from Copenhagen to Nyk�bing (Falster) station. Here they will be unlinked. One unit remains in Nyk�bing while the other one continues to R�dby ferry harbour, is packed on a rail ferry and will cross the strait to Germany and then continue to Hamburg. 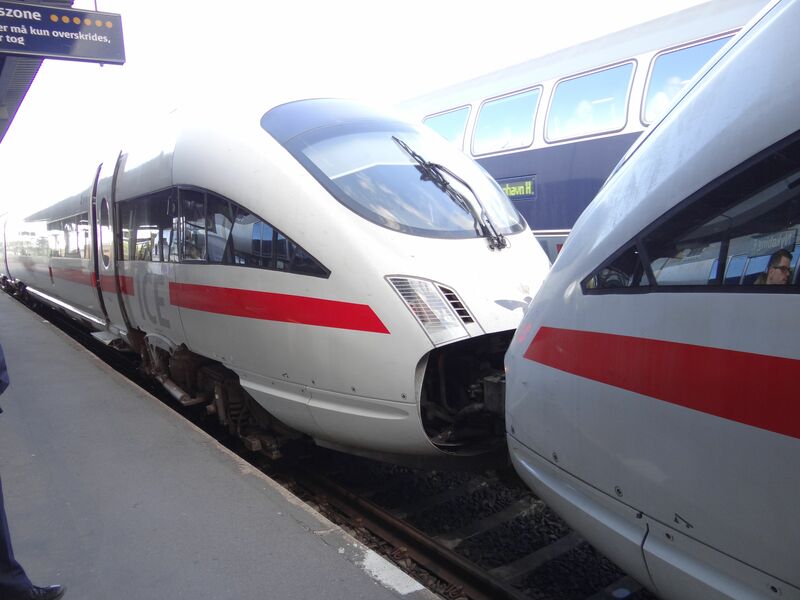 In 2016 this habit will be broken: The rail+ferry connection to Hamburg has become so popular that one ICE-TD is not enough and two will not fit on the ferry. But two units of IC3 rubbernoses just barely fit, so IC3s will yet again replace the newer ICEs in this traffic. Picture at Nyk�bing (Falster) station 21.9.2014 by Ilkka Siissalo. Same two ICE-TD trains as above. The driver is leaning out of his window to see when he gets a signal that the two units have been successfully uncoupled and he can move his unit forward. Picture at Nyk�bing (Falster) station 21.9.2014 by Ilkka Siissalo. 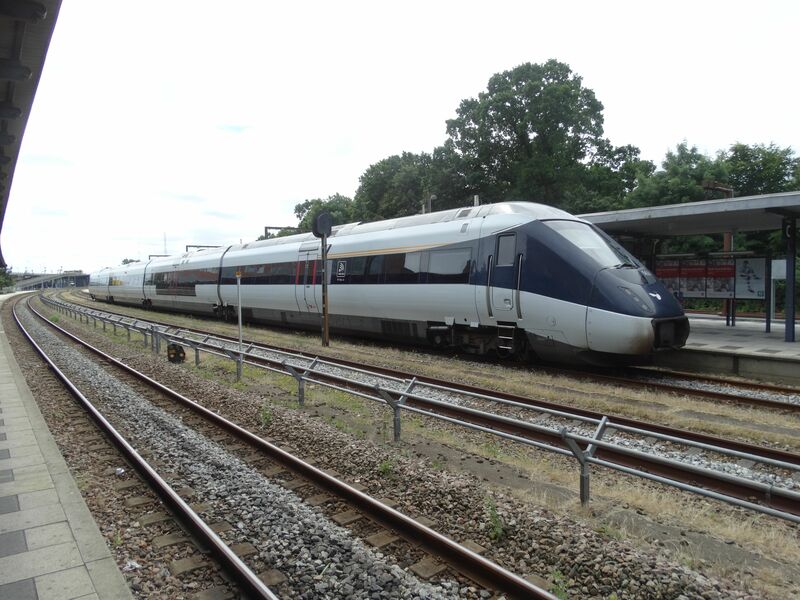 DSB IC3 train (class MFA) as they are today. 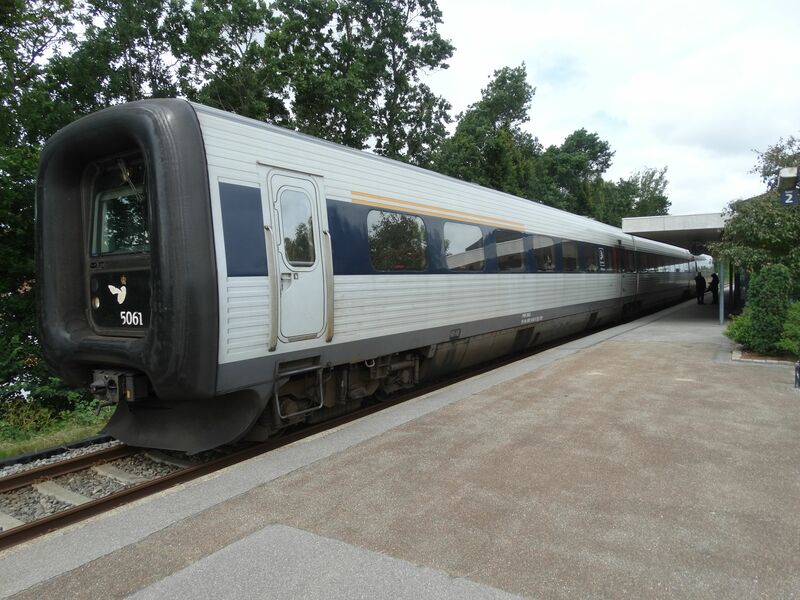 DSB has exactly similar "rubberface" trains both as diesels and as electric multiple units, always as 3 coach sets when it comes to diesel. Often they are coupled together in main line traffic so that part of the IC3 train is diesel and part is electric powered. 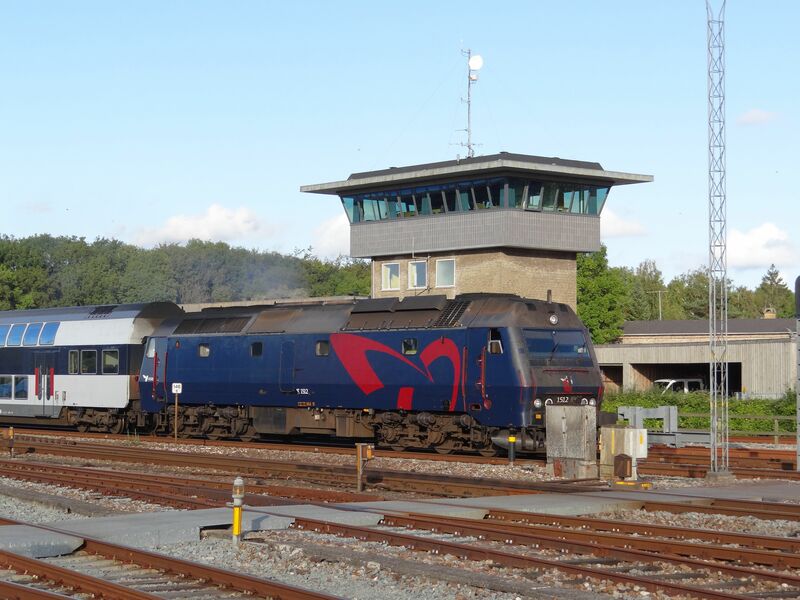 Photo at Br�nderslev station 7.7.2016 by Ilkka Siissalo. 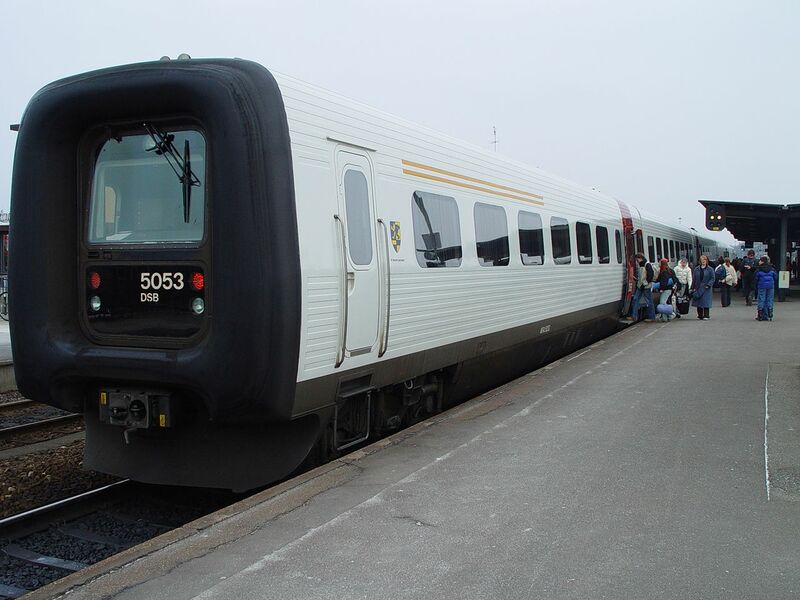 In 2003 IC3 trains were still white with red doors and looked pretty new and fresh. Picture from Nyk�bing station 2.3.2003 by Ilkka Siissalo. This is the Italian AnsaldoBreda built IC4 train, which has become famous for being too late and so crappy. Years and years late and now, when they finally are in operation, only about 50% of the fleet can be kept moving. Lawyers are the only ones who benefit on this. Picture at Aalborg station 7.7.2016 by Ilkka Siissalo. Another view of an IC4. Picture at Aalborg station 7.7.2016 by Ilkka Siissalo. 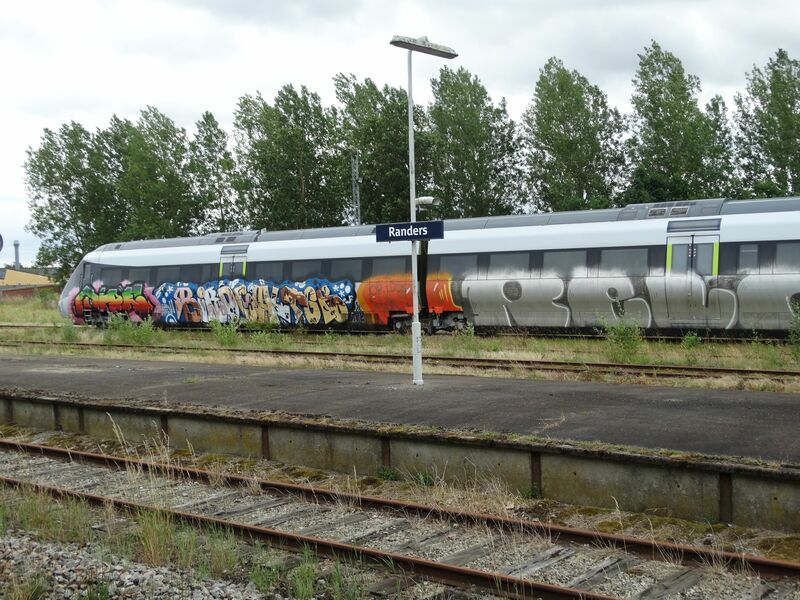 Denmark still has a really bad graffiti problem with trains, and especially as broken trains of the Italian IC4 and IC2 classes often stand still for longer periods, they get awfully badly spoiled by vandals. Picture at Randers station 7.7.2016 by Ilkka Siissalo. Two Italians kissing - the coupling of two IC4 units. At least these two units are not broken at this moment. Picture at Randers station 7.7.2016 by Ilkka Siissalo. IC2 is the two coach version of the Italian AnsaldoBreda. Currently they are all out of service and legal action against the builder is ongoing, as DSB still hopes to be able to cancel the purchasing of these lousy trains and return them to the manufacturer. 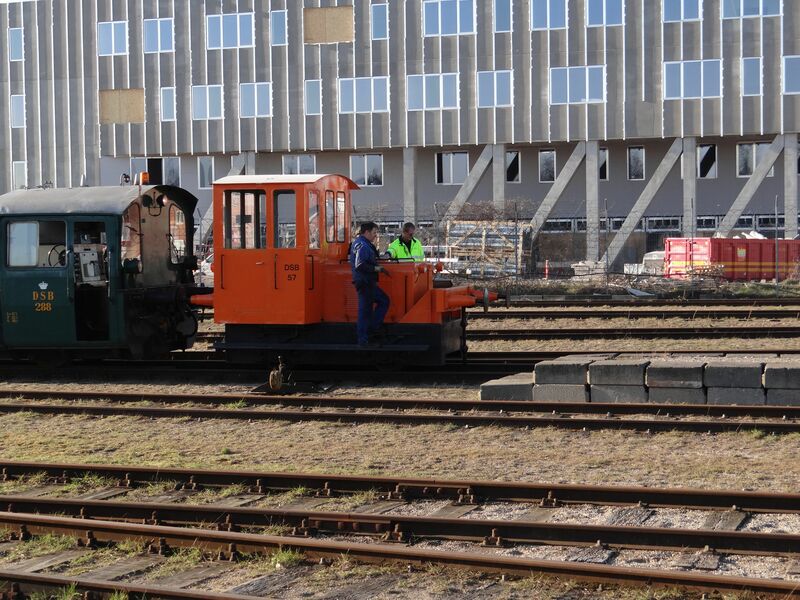 As a result all possible parking places are full of them, like here at Aarhus works of DSB. 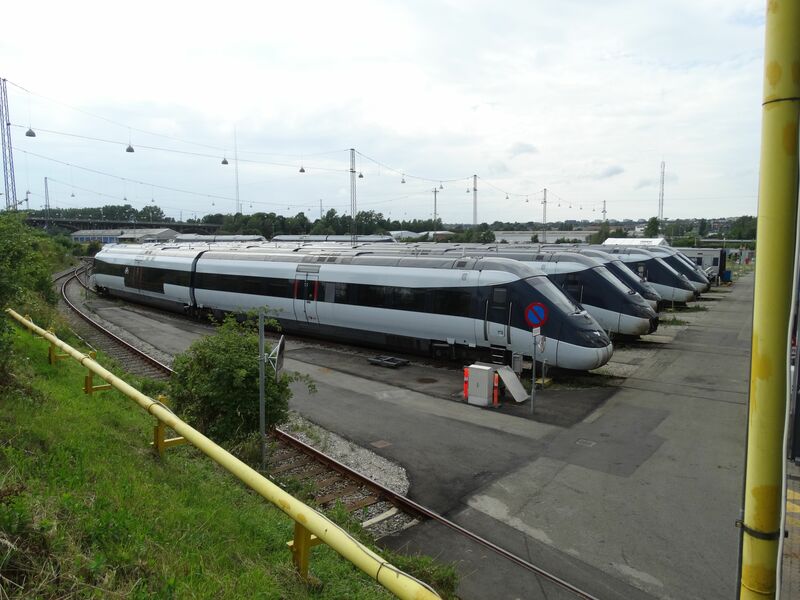 At the time when DSB gave up trying to use them in the summer of 2016, only seven units were in such a condition that they could move. 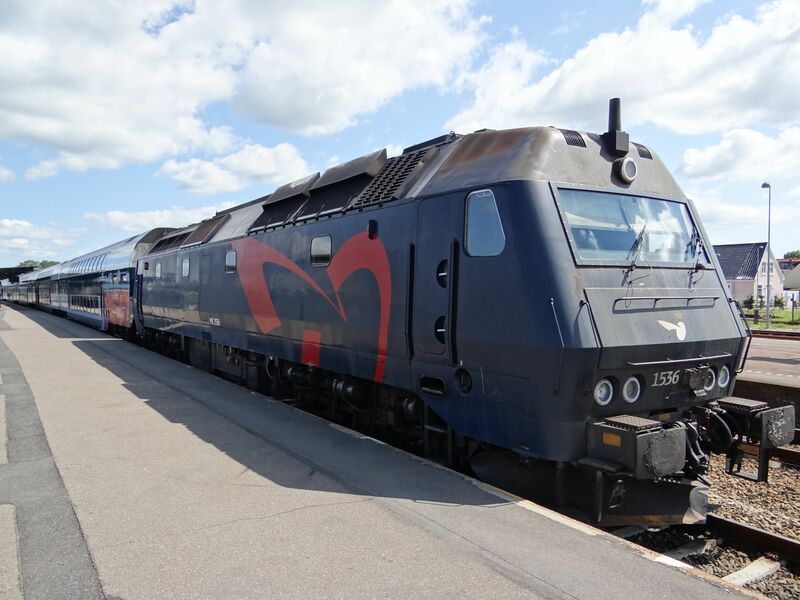 Note that several private railroads in Denmark also have units called IC2, which are of the so called "rubberface" type and have absolutely nothing to do with these Italian fiascos. Picture 7.7.2016 by Ilkka Siissalo. This is the model that the Italian IC2 was supposed to push aside. This is a class MRD lightweight diesel multiple unit built by Scandia in Randers, based by a German D�wag design in 1983. They have been used most of their life especially on sidelines on the Jutland peninsula, but they have become rare lately. Picture at Aalborg station 31.8.2016 by Ilkka Siissalo. 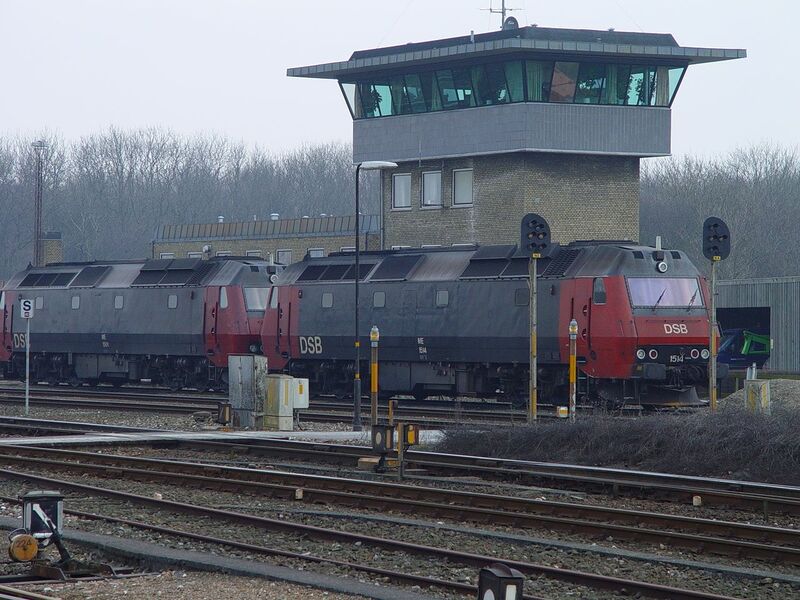 Another picture of the old class MRD, this time two units standing as an operational reserve at Odense station 12.3.2014. Picture by Ilkka Siissalo. 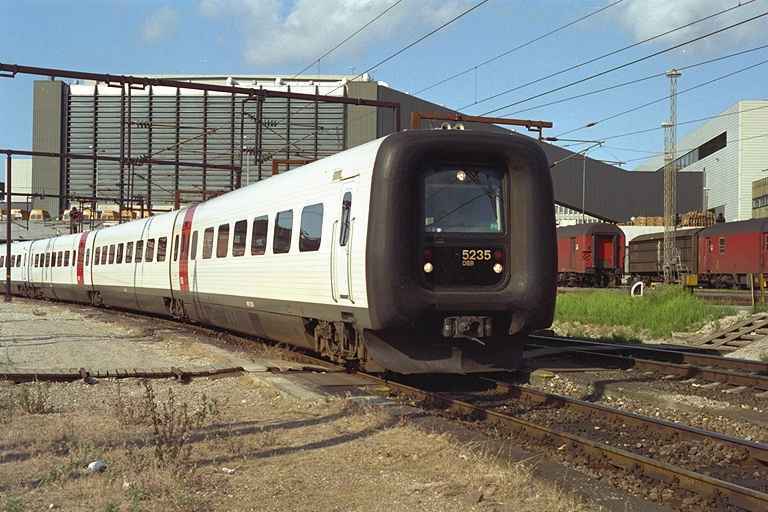 This is a Siemens made Desiro railbus, in Denmark known as class MQ. 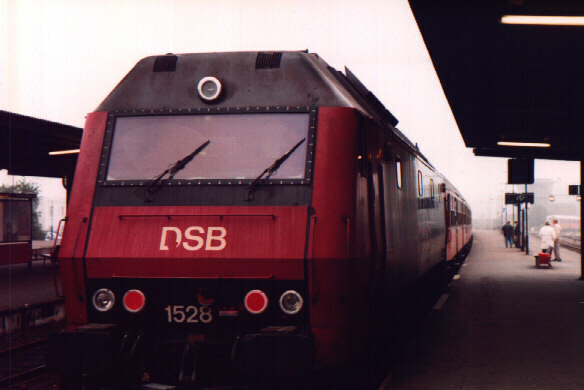 DSB bought 12 of them in 2002 and a further 8 in 2010. 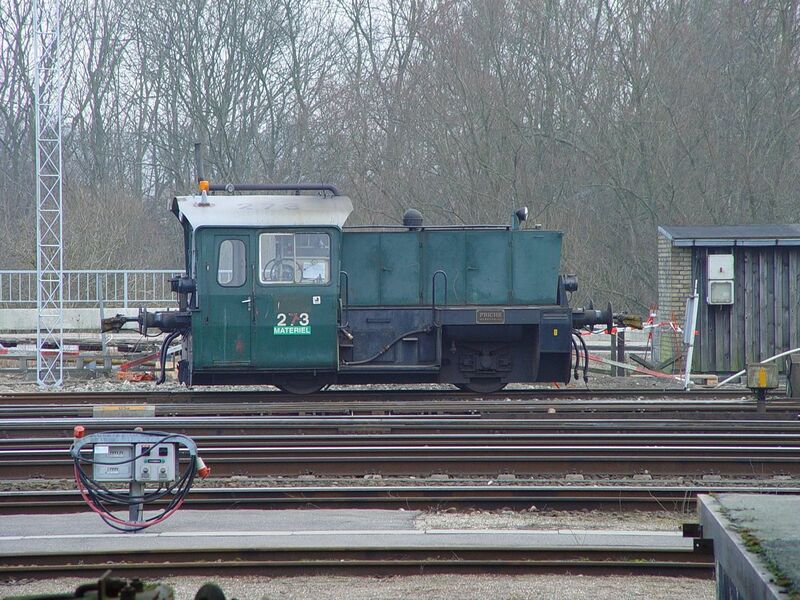 They also were intended as a replacement for the old MRD shown above. Photo at Odense station 12.3.2014 by Ilkka Siissalo. 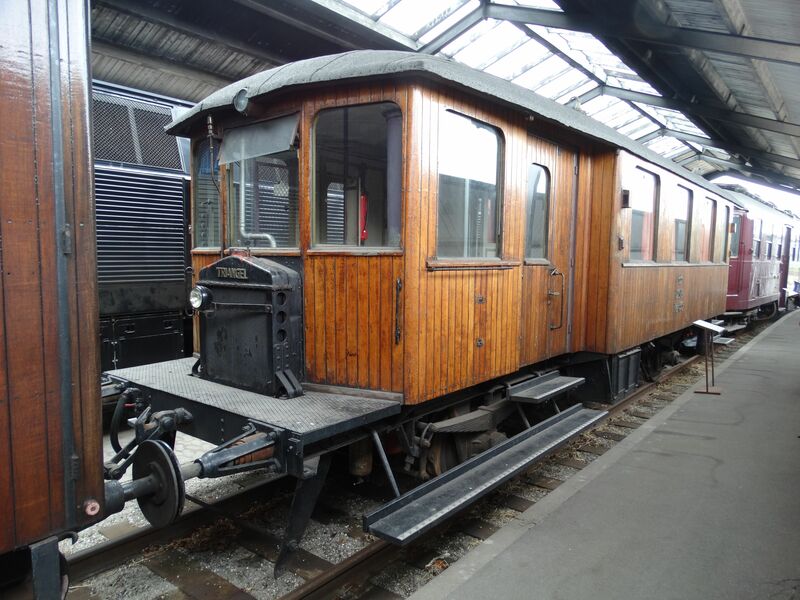 1950s elegance from Sweden, copied from 1930s elegance from USA: A DSB class MY Nohab at the Danish national railway museum in Odense. Picture by Ilkka Siissalo 3.7.2004. This is a K�f II, originally a German army design from the wartime. 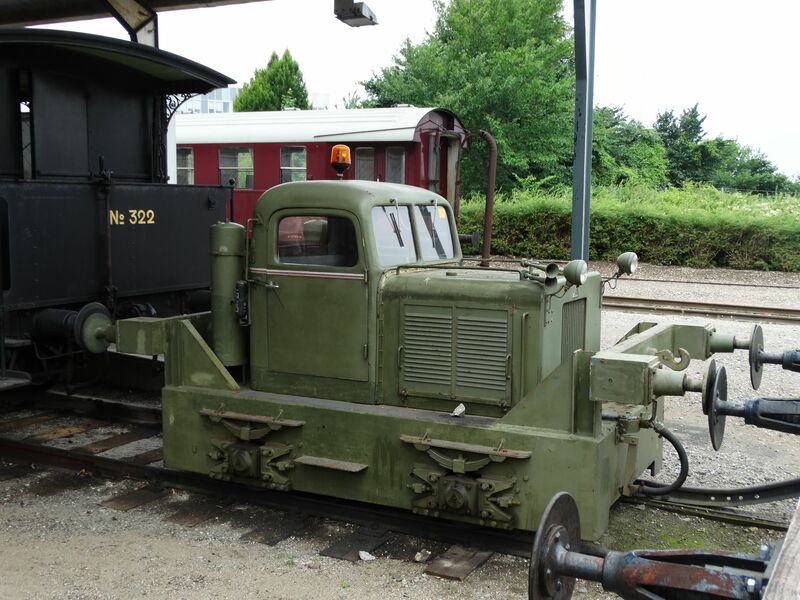 K�f II stands for "Kleinlokomotive, �lgefeuert, II Generation" or small locomotive, (diesel) oil powered, second generation. The original idea was that it was easier to move trains in the vicinity of enemy during war time when there was no cloud of smoke to reveal the engine. 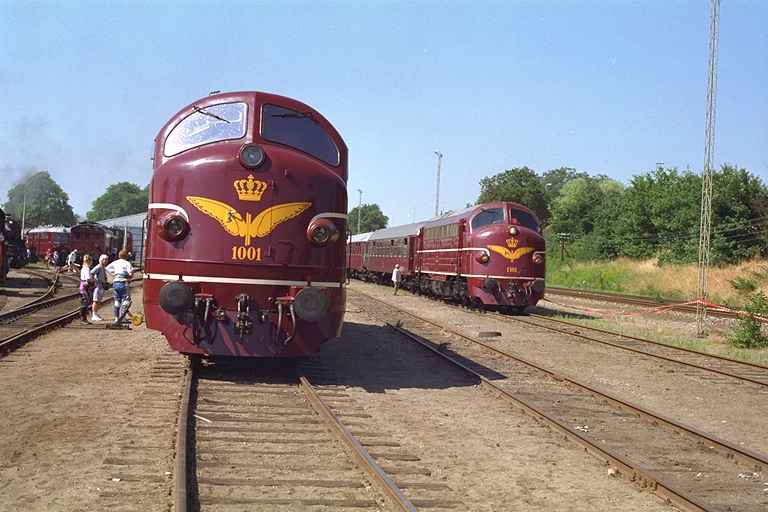 Germany, which had invaded Denmark, forced also Danish factories to build several types of German locomotives and the Danes continued making them after the war. 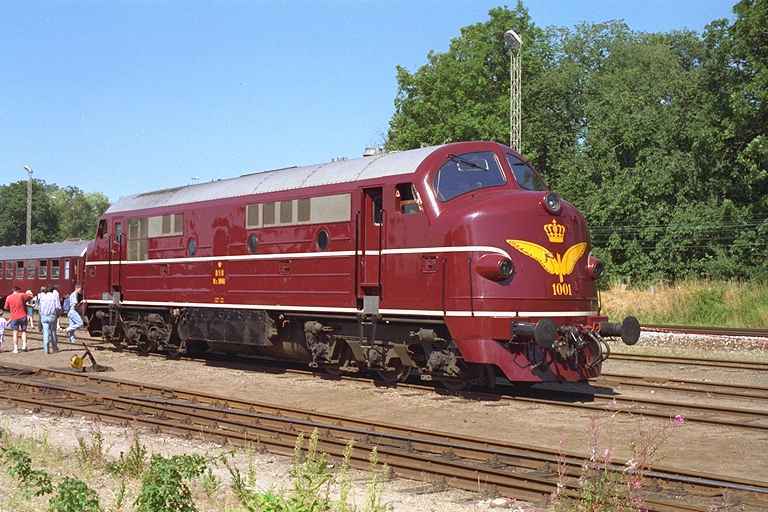 This one has been built by Frichs in 1947, but K�f IIs were built in Denmark all the time until 1969. 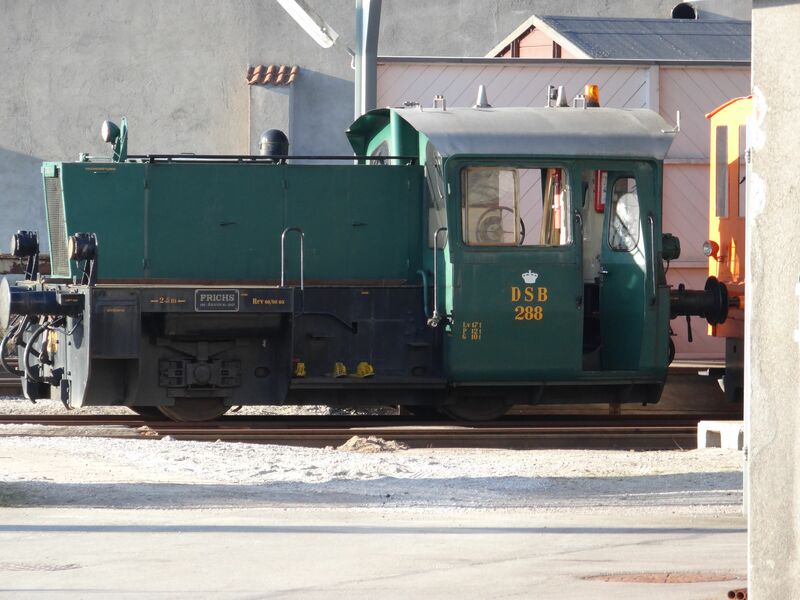 Picture at the Danish railways museum in Odense 13.3.2014 by Ilkka Siissalo. One of the old K�f II diesel tractors was still in 2003 working in its very old green paintings in Nyk�bing (Falster) station as Ilkka Siissalo took this photo on 2.3.2003. 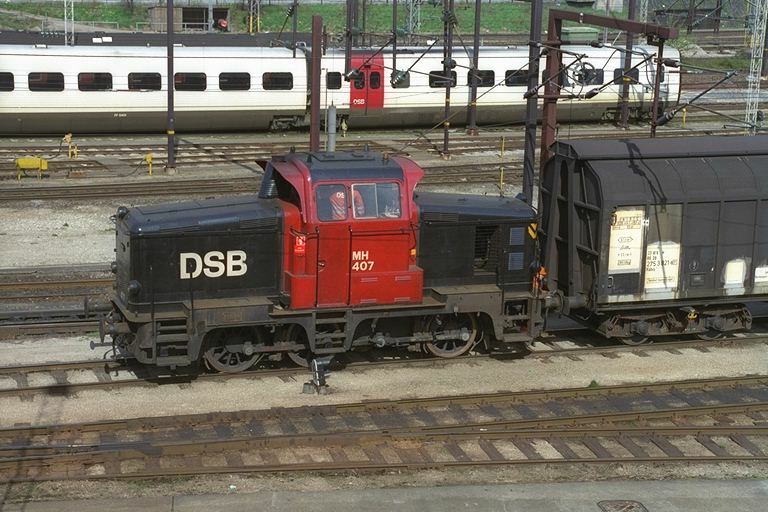 Design from the times of World war II, built in 1966 and still in full use in 2014: One of the old K�f II diesel tractors, but this time in DSB's red and black paintings. It looks already pretty old and crappy. Picture from Nyk�bing (Falster) station by Ilkka Siissalo 21.9.2014. Driver's controls of the same K�f II as above. It's clear that the design is right from the 1940s. 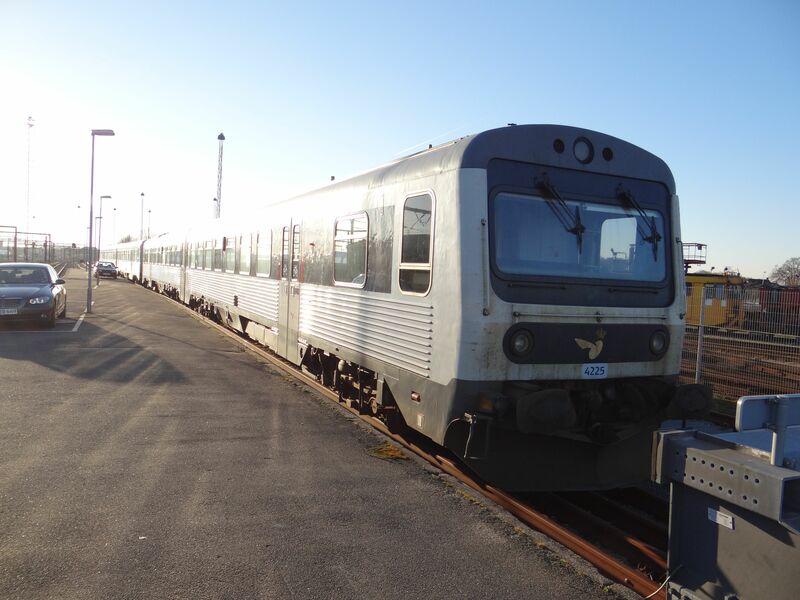 Picture from Nyk�bing (Falster) station by Ilkka Siissalo 21.9.2014. 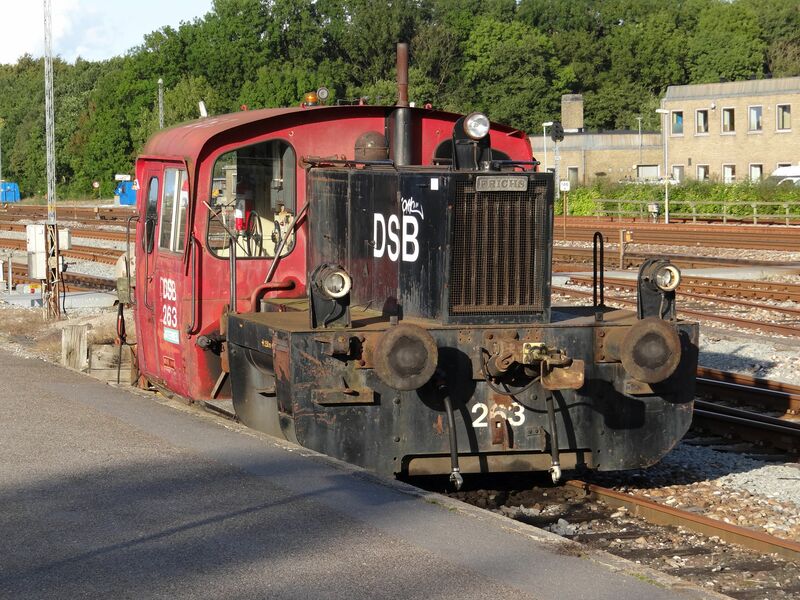 DSB tractor no.57 was built by Pedersh�b in 1953. 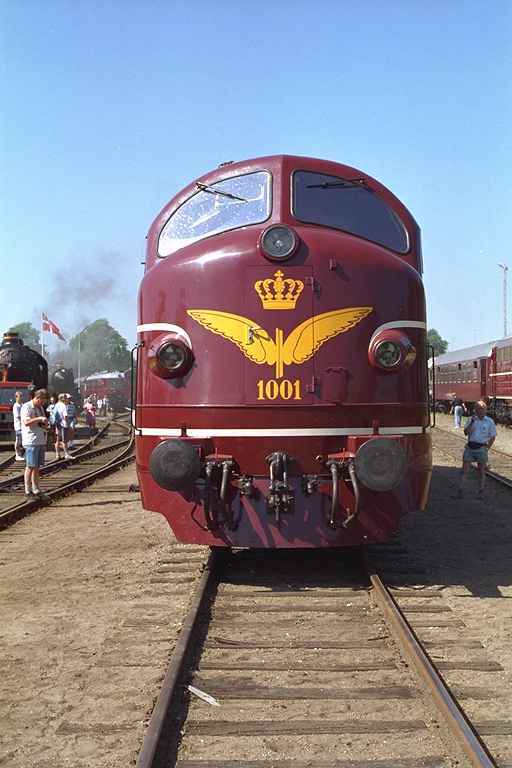 Now it is kept at the national railway museum in Odense. Picture in Odense 13.3.2014 by Ilkka Siissalo. 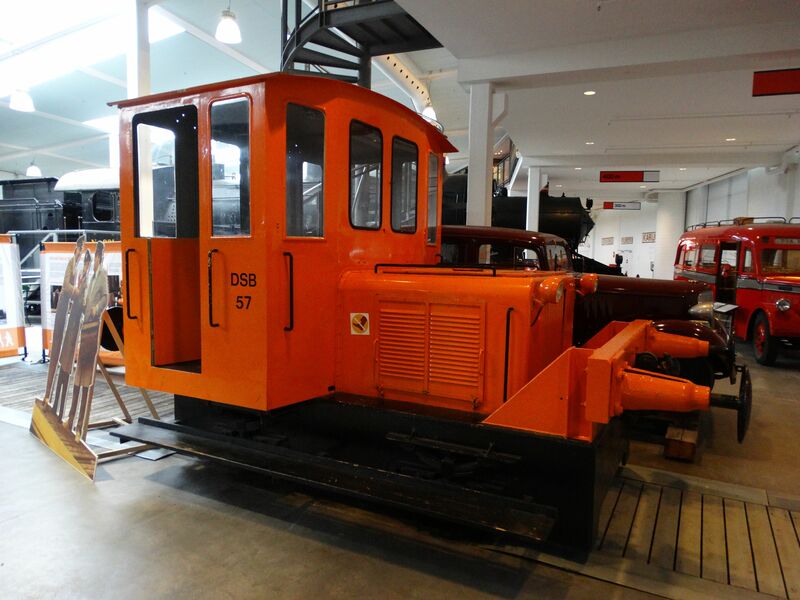 Another picture of the same tractor no.57 from the national railway museum in Odense. Picture in Odense 10.7.2016 by Ilkka Siissalo. 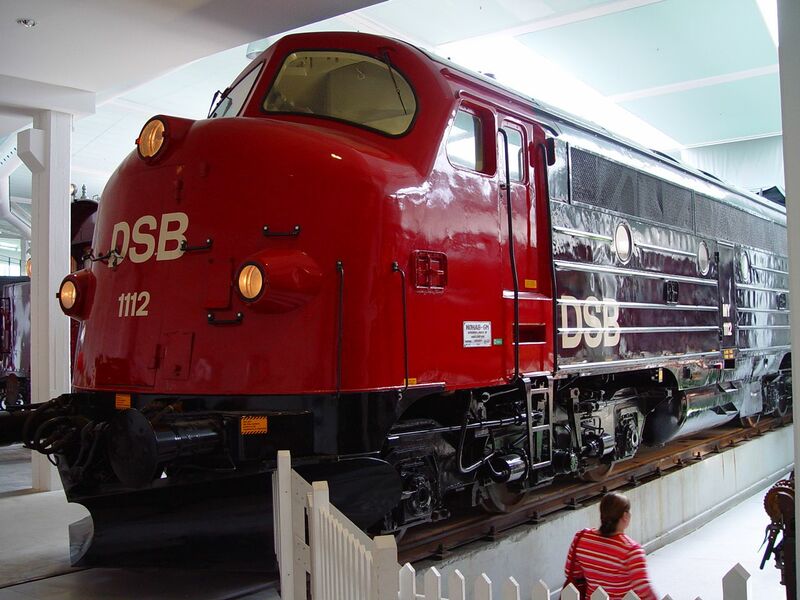 The last remaining class MH locomotives are now in museum. Picture at the Danish railway museum in Odense 10.7.2016 by Ilkka Siissalo. 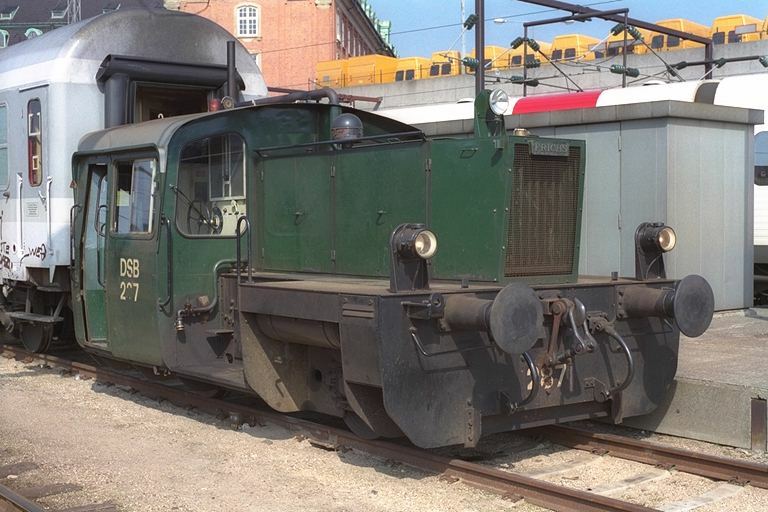 The class ME railbuses (not to be confused with a later class ME big diesel engine, shown on this page above) built by Triangle in 1927-28 were the first motor railbuses of Denmark. They soon became too small and were too heavy for their little payload, but were still an important improvement over smoky steam engines. Picture at the Danish railway museum in Odense 10.7.2016 by Ilkka Siissalo. When Nazi Germany invaded Denmark, the Germans built a new air force base at Skrydstrup and also a rail connection to the airfield. After the war Danish air force took over. They used this tractor "P.M. Motor-Lokomotiv" no.459 built by Pedersh�b in 1954 for moving of wagons between the air base and the nearest station. Picture at the Danish national railway museum in Odense 10.7.2016 by Ilkka Siissalo. 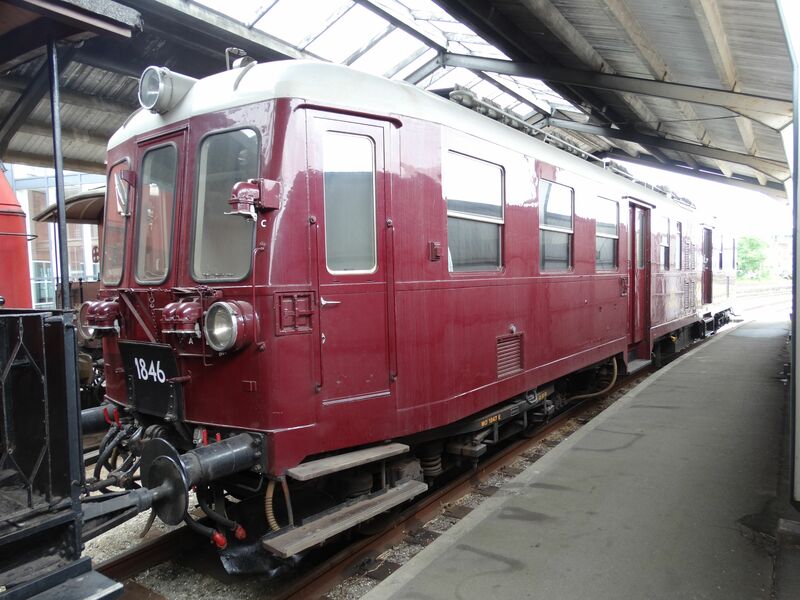 This DSB class MO diesel railbus was built by Frichs in �rhus in 1954. Built from the 1930s till 1958 the class MO was very common on side lines throughout the country and at one point of time they were the most common trains of the country and were used even in express trains. Seven units have survived until today. Picture of MO 1846 at the Danish national railway museum in Odense 10.7.2016 by Ilkka Siissalo.